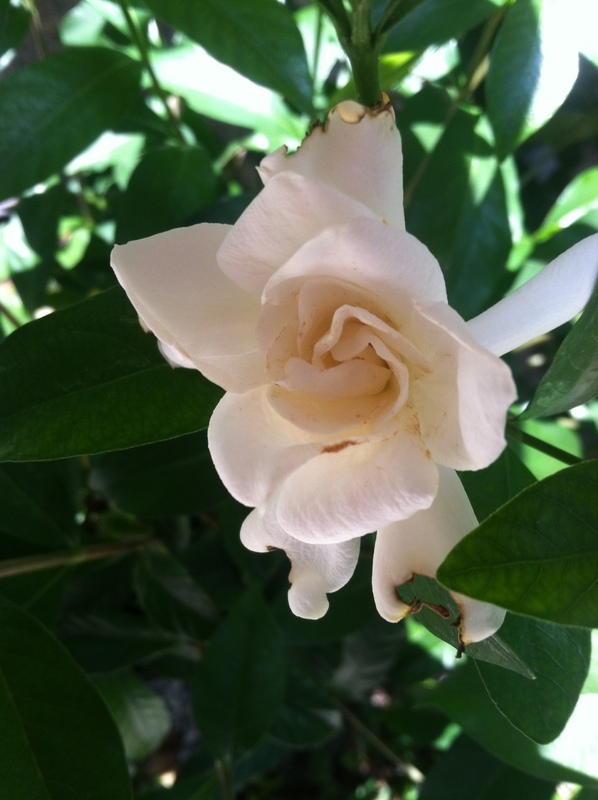 A favorite late summer bloom…Gardenia, [Gardenia jasminoides]…is one of my all time favorites. With lovely, creamy white blooms and fragrance beyond belief, the Gardenia is a tradition almost always found in southern gardens. The bloom shown is ‘August Beauty’ from an evergreen shrub easily grown in rich, well-drained acidic soil. Mine grows in a big container sitting by the front door, actually near my lemon trees. Growing up I remember the traditional prom corsage…an exquisite single gardenia bloom mixed with fern and the waxy green leaves…I felt so sophisticated! So many of the other girls had carnations…simply too ordinary. Anyway, while the shrub is in bloom I do pluck a single flower and set it in a tiny crystal bowl of water…the bloom will scent an area for hours. Everyday I do this until the blooms finally stop happening…a treat I look forward to every year! Lemon trees are blooming and fruiting at the same time…the weather has totally confused them! My lemons are growing quickly and will most likely be turning yellow in a few weeks. This is such a fascinating process to observe…fragrant blooms then luscious lemons later in the season. if the tiny new lemons do not form and quickly turn yellow before the winter freeze, I’ll just move their pots into the garage and place by the window. Of course, lemon trees, if well established and grown organically, can withstand a bit of mild freeze…but not blooms or fruit! Last year I left my trees on the front porch and covered them with a flannel sheet during extremely cold nights, which I think is why they bloomed so much this season…course the seaweed and cider vinegar helped a bit, too! One of my favorite garden plants is a sweet olive tree [osmanthus]. The tree is evergreen and blooms occur in early spring and again in fall. The scent is reminiscent of orange blossoms…I remember that fragrance so well from time spent driving south from LA into Orange County in the early winter…orange blossoms in bloom filled the air! Driving with the top down was certainly an advantage during the season! GARDEN NOTES…By early September you should have a fall-winter greens garden started. As long as temps are below 80 you can plant the salad greens, kale and cabbage starts…I threw out mesclun mix seeds last week and have had to work to keep them watered in the high heat. They’ve sprouted and are forming ‘true’ leaves…must keep soil consistently moist!! Tomato plants will continue to flower and fruit into the time of first frost…on an organic program. The most important care right now is consistent moisture and removal of many of the leaves that hide fruit from the sun…this will actually encourage the fruit to ripen and reduce watering. Gladiolus callianthus, Peacock Orchid OR Acidanthera, its new name for now, is a relative of gladiolas…masses of blooms in late summer, offers a heavenly scent, somewhat like baby powder. Plant tiny bulbs/corms in EARLY spring. I plant by the edge of my rock dry creek bed near the path in order to enjoy fragrance as I wander through the garden. They really appreciate the warmth afforded them by the rocks in winter.Corms do need to have consistent moisture in well-drained soil. I have also planted some in pots to enjoy the blooms and fragrance on the back porch. The Victorians loved these Acidanthera blooms and used them for cut flowers…the blooms and scent last quite a good while in a vase…a sensory delight anywhere. 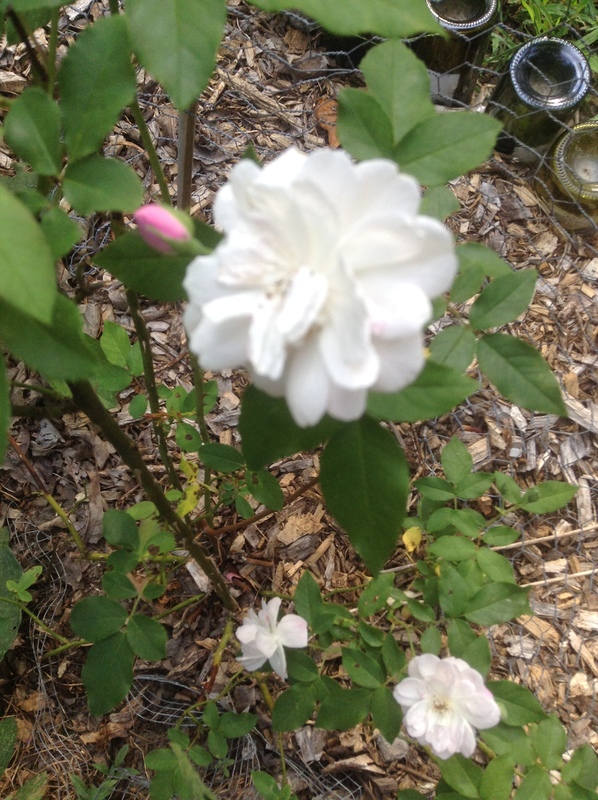 My rose, Blush Noisette, in bloom…ah, the fragrance is so heavenly! The bush is covered in these sweet little clusters of blossoms. Now is such a remarkable time of year when the garden is in full, glorious bloom and fragrance fills the path winding through the back yard. 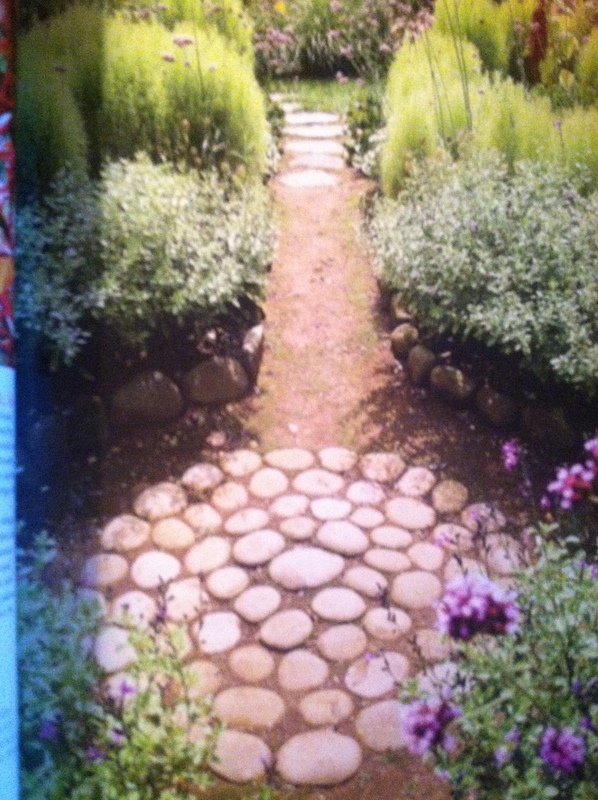 Love the idea of this path and think I will need to find a spot to do this in my yard!! Previous Article ALFRESCO…or, in the open air.